PT Perkebunan Nusantara XI (Persero) - PTPN XI is an Indonesian Government-owned corporation that is involved in agribusiness industry. PTPN XI has its business activities focused in sugar cane plantation that produces sugar and molasses. PTPN XI is fully-owned by the Government of Indonesia. PTPN XI has its legal domicile in Surabaya East Java and was established as a limited liability company under the Indonesian Government Regulation Number 16 of 1996 dated 14 February 1996. The Company's head office is located at Jl Merak No 1 Surabaya 60175. At present, PTPN XI has 1 liason office, 1 business unit of sack factory, 1 business unit of alcohol and spirit distillation factory, 16 business units of sugar factories, 4 hospital units and 2 health clinics. In 2014, the Company's total income in reported 28.03% down. According to PTPN XI's Annual Report 2014 as cited by JobsCDC.com, the Company’s total income in 2014 amounted to Rp 1,509.76 billion as compared to the year 2013 amounted to Rp 2,097.80 billion. PTPN XI recorded total assets of Rp 2,577.04 billion in 2014, down 13.67% from Rp 2,985.31 billion from the same period last year. S1 Economics - Accounting (EA), Business/Marketing Management (EMP), HR Management (EMS). Maximum age of 30 years old by 31 January 2016. Possess a minimum cumulative GPA of 2.75 (for PTN) or 3.00 on a 4.00 grade scale (for PTS). Physically and mentally healthy, not color blind, drug-free, well-behaved. 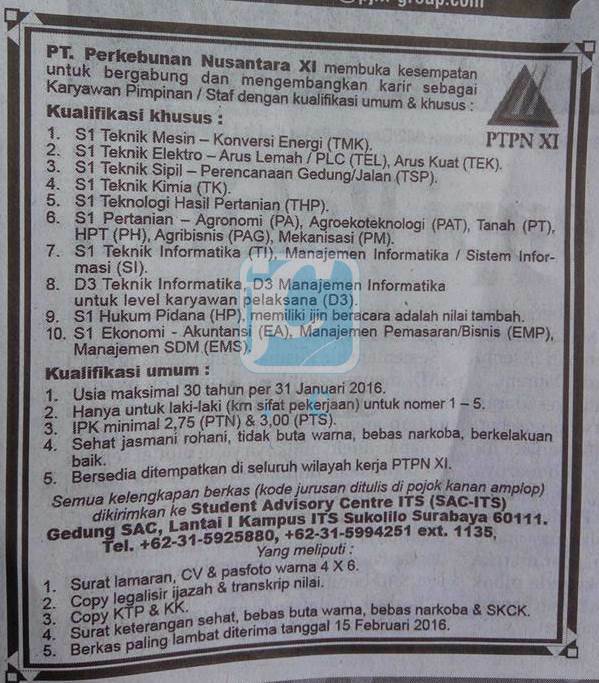 Willing to be placed in all working area of PTPN XI. JobsCDC.com now available on android device. Download now on Google Play here. Please be aware of recruitment fraud. The entire stage of this selection process is free of charge. PT Perkebunan Nusantara XI (Persero) - D3, S1 Fresh Graduate Program PTPN XI Group February 2016 will never ask for fees or upfront payments for any purposes during the recruitment process such as transportation and accommodation.